Super modern electronic and computer industry started by enthusiasts in private garages. Perhaps the “garage” laboratories will lead in the future to similar progress in the field of molecular biology. Modern science boasts many achievements, but for some reason, some believe that it has left the spirit of “pioneering” inherent in the scientific and technological revolution of the late XIX century. That time, world-class research could be carried out in a home laboratory, but now it requires complex and expensive equipment. Of course, truly revolutionary ideas continue to come to only selected minds, but testing a hypothesis and bringing research in the field of molecular biology is expensive and extremely laborious, going far beyond the limits of the lonely scientist. However, not only large teams with appropriate funding can contribute to science, but also enthusiasts outside of any system. 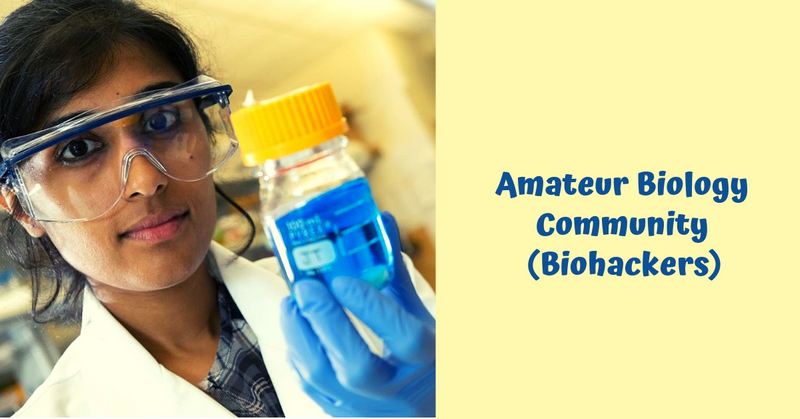 They call themselves biohackers (amateur biology community). Biohackers are independent amateur scientists conducting experiments in independently equipped home laboratories. They may have completely different goals: some check their brilliant ideas, others do it just for fun, like a hobby. Since the roots of the biohackers movement are in California, not far from Silicon Valley, their initiative is often called “garage biotech”. Why garage? Of course, because American high-tech was born in the garage. The history of biohackers began with the American postgraduate physicist Rob Carlson, who drastically changed his field of study after defending a dissertation at Princeton University in 1997. Accidentally, he got into a conversation with the Nobel laureate Sydney Brenner, who invited him to his own biology department at his own Berkeley Institute for Molecular Studies in Berkeley (California). Mastering molecular biological methods in a team of biologists, physicists and engineers, Rob involuntarily compared the leading edge of biological research to the subculture of patched hacker enthusiasts who had revolutionized personal computers 25 years before. He was obsessive with one idea: if one makes biotechnology accessible to the masses of amateurs and enthusiasts, this will lead to the emergence of a new subculture of “garage biology” and, possibly, a new revolution. Moreover, most of the equipment (second-hand, of course) can be bought at a substantial discount via the Internet. In 2005, Carlson outlined his vision of amateur science and its fundamental accessibility to independent researchers in the journal Wired. In order not to be unsubstantiated, he decided to organize such a laboratory at home and got used micropipettes and a centrifuge bought on eBay. Quite unexpectedly, his idea received the support of many followers of an independent scientific search – both professionals leading their own projects at home and biology amateurs who began to unite into the DIY-bio organization (“do it yourself”). These people buy second-hand and decommissioned laboratory equipment via the Internet, make microscopes from ten-dollar webcams, and use their own armpits for incubating genetically modified bacteria (instead of serial thermostats), which maintain a temperature of 37° C. Somewhere in the US, biohackers have created small amateur biology communities where you can use a variety of equipment for a small fee. In addition, there were similar cases in America before: for example, if a scientist wanted to patent something independently of his company, he would officially indicate his personal garage as a place to conduct all the research! Of course, most scientists are sceptical about amateur biologists, avoiding the idea that someone might need a thermal cycler or centrifuge at home. However, in this regard, we can recall the words of Ken Olsen, the founder of Digital Equipment Corporation, who said: “I don’t know why someone might need a computer at home.” Now his statement is perceived as a funny aphorism. However, it is hardly worthwhile to seriously expect major scientific breakthroughs made by self-taught biologists in their own kitchen: a genius will rather prefer to work in a normal laboratory, where there are much more opportunities for scientific self-realization. However, there are some important aspects here: first of all, the confirmation of hacker principles in relation to modern biological research, as well as the desire for knowledge and the scientific way of thinking, regardless of the particular profession and occupation of a person. Biohackers have a marvellous imagination: for example, Meredith Patterson, a programmer from San Francisco, became famous for creating yoghurt glowing in the dark by incorporating a fluorescent protein into the genome of dairy bacteria (by the way, in 2008, he was awarded the Nobel Prize in Chemistry). Other biohackers are studying their own genome, and even conduct small clinical studies in the hope of finding the roots of some disease. The “Genomic Blogger,” known by the pseudonym Dienekes Pontikos, was stunned by geneticist graduate student Joseph Pickrell, who published his sequenced gene on the Internet after he had found evidence of his Jewish origin in the DNA sequence. Several groups are committed to trying to create a promising biofuel formula to solve the energy crisis problem. Finally, a few more parties develop inexpensive open-source laboratory instruments, such as PCR machines, and even publish instructions for self-assembly of these units. All this makes amateur biology communities closer to people and increases the popularity of this hobby. The “new wave” in biological science has created civilian “garage” laboratories and “hackerspaces” – hobby groups that unite people who are interested in biotechnology and implement projects that are sometimes worthy of advanced research institutions. One of the famous biohacker projects is Bioluminescence. Its goal is to “crack” the code of a living cell so that it shines using the luciferase mechanism. Launched in the first Biocurious hackerspace (San Jose, USA), this project draws inspiration from the “registry of standard bioparts”. In 2013, this project successfully collected funding on the website “kickstarter”, designed to raise money for the whole world for all sorts of creative endeavours. Two “garage biohackers” from California – Tito Jankowski and Josh Perfetto – strived to produce one of the most common do-it-yourself devices in the molecular-biological laboratory. The main idea was the lowest possible price of the device, consisting mainly of commonly available components: a plywood case, a computer power supply unit, a thermoelement, the simplest electronics for connecting to a computer. The instructions for making such a device are published on the Internet, so one can make an analogue without even buying a “do-it-yourself” kit. OpenPCR also received initial funding via “kickstarter”. The claimed amount of $6,000 was collected in ten days, and later this amount doubled. The so-called synthetic biology is especially popular among biohackers. It postulates the possibility of constructing living systems from separate genetic blocks, the list of which is even posted on the Internet, like the source codes of software. However, the progress in this field is still rather modest, and scientists haven’t succeeded in making anything more complicated than the lactose operon (fragment of the genome encoding lactose metabolism in bacteria). Today, the most significant achievement of synthetic biology is a chemical synthesis of the full genome of the bacterium, made in 2010 under the leadership of Craig Venter at his own institute. Eight years after moving to the garages, Carlson is still convinced that amateur biology can revolutionize.